Hc Verma i Solutions for Class 11 Science Physics Chapter 10 Rotational Mechanics are provided here with simple step-by-step explanations. These solutions for Rotational Mechanics are extremely popular among class 11 Science students for Physics Rotational Mechanics Solutions come handy for quickly completing your homework and preparing for exams. All questions and answers from the Hc Verma i Book of class 11 Science Physics Chapter 10 are provided here for you for free. You will also love the ad-free experience on Meritnation’s Hc Verma i Solutions. All Hc Verma i Solutions for class 11 Science Physics are prepared by experts and are 100% accurate. Can an object be in pure translation as well as in pure rotation? Yes, such motion is possible if the translation takes place along the axis of rotation. This type of motion is called screw motion. A simple pendulum is a point mass suspended by a light thread from a fixed point. The particle is displaced towards one side and then released. It makes small oscillations. Is the motion of such a simple pendulum a pure rotation? If yes, where is the axis of rotation? Yes, it is an example of pure rotation. The axis of rotation passes through the pivot of the pendulum, perpendicular to the plane containing the pendulum. No, we cannot use componendo-dividendo theorem of proportion here. This is because α and a, and v and ω are dimensionally different. Therefore, ​v + ω and/or ​α + a are not possible. A ball is whirled in a circle by attaching it to a fixed point with a string. Is there an angular rotation of the ball about its centre? If yes, is this angular velocity equal to the angular velocity of the ball about the fixed point? Yes, there is an angular rotation of the ball about its centre. Yes, angular velocity of the ball about its centre is same as the angular velocity of the ball about the fixed point. Let the time period of angular rotation of the ball be T.
After one revolution about the fixed centre is completed, the ball has come back to its original position. In this case, the point at which the ball meets with the string is again visible after one revolution. This means that it has undertaken one complete rotation about its centre. So, angular velocity is again ​2πT. Thus, in both the cases, angular velocities are the same. The moon rotates about the earth in such a way that only one hemisphere of the moon faces the earth (figure 10-Q1). Can we ever see the "other face" of the moon from the earth? Can a person on the moon ever see all the faces of the earth? No, we cannot see the other face of the Moon from the Earth. Yes, a person on the Moon can see all the faces of the Earth. Explanation: Angular velocity of the Moon about its own axis of rotation is same as its angular velocity of revolution about the Earth. This means that its rotation time period equals its revolution time period. So, we can see only one face of the Moon from the Earth. However, angular velocity of the Earth about its axis is not same as the angular velocity of Moon about the Earth. So, all the faces of the Earth is visible from the Moon. The torque of the weight of any body about any vertical axis is zero. If it always correct? No, its not always correct. But in fig. 2, as R and CM do not lie along the same vertical line, there exists a torque about the vertical axis. The torque of a force →F about a point is defined as →Γ=→r×→F. Suppose →r, →F and →Γ are all nonzero. Is r×→Γ||→F always true? Is it ever true? No,→ r×→τ|| →Γ is not true.In fact, it is never true. This is because:→ r×→τ=→ r×→ r×→FApplying vector triple product, we get:→ r×→ r×→F=→ r.→F→ r-→ r.→ r→F∵→ r.→ r=r2=→ r.→F→ r-r2→FIf → r.→F=0; that is, →r⊥→F, then:→ r×→Γ=-r2→FWe know that r2 is never negative and → r×→Γ=-r2→.FThis implies that both vectors may be antiparallel to each other but not parallel. A heavy particle of mass m falls freely near the earth's surface. What is the torque acting on this particle about a point 50 cm east to the line of motion? Does this torque produce any angular acceleration in the particle? If several forces act on a particle, the total torque on the particle may be obtained by first finding the resultant force and then taking torque of this resultant. Prove this. Is this result valid for the forces acting on different particles of a body in such a way that their lines of action intersect at a common point? Let f1→ , f2 →, f3→ ,... fn→ be the forces acting on a point P.Let O be the point along which torques moments will be taken.Let: f1→ + f2 →+ f3→ +...+ fn→=R→ ...1Moments of force torque fi→ about O will be:τ1→=OP →×f1→The sum of the torques about O will be:M→= OP →×f1→+OP →×f2→+...+OP →×fn→⇒ M→= OP →×f1→+f2→+f3→ +...+fn→⇒ M→=OP →×R→ From 1Thus, we see that the torque of the resultant force R→ of the forces f1→ , f2 →, f3→, ..., fn→ gives the sum of the moments of the torques. If the sum of all the forces acting on a body is zero, is it necessarily in equilibrium? If the sum of all the forces on a particle is zero, is it necessarily in equilibrium? No, if the sum of all the forces acting on a body is zero, the body is not necessarily in equilibrium. To be in equilibrium, the sum of torque acting on the body must be zero too (see the fig.). In the above case, although the sum of the forces acting on the body is zero (F1→+-F1→=0). Still, the body will rotate along OP→. So, it won't remain in equilibrium. If the angular momentum of a body is found to be zero about a point, is it necessary that it will also be zero about a different point? No, angular momentum is dependent on the position vector of the particle, angle between the radius vector and the linear velocity of the particle. So, there may be finite angular momentum along any different point even if it is zero at a particular point.If angular momentum is zero along O' but finite along O. If the resultant torque of all the forces acting on a body is zero about a point, is it necessary that it will be zero about any other point? No, it is not necessary that the torque about any other point be zero if it is zero about one point. Let F →be the resultant force due to all the forces acting on the plane of the body. Therefore, torque due to force F→ at any pointwill be the resultant torque. Now, we see that the torque due to F →at point Q will be zero because Q lies on the line of support of the force F but the torque due to force F→ will not be zero along the point P.
A body is in translational equilibrium under the action of coplanar forces. If the torque of these forces is zero about a point, is it necessary that it will also be zero about any other point? Yes , if the torque due to forces in translation equillibriumis zero about a point, it will be zero about other point in the plane. Let us consider a planner lamina of some mass, acted upon byforces F1→, F2→, ... Fi→, etc.Let a force Fi→ act on a ith particle and torque due to Fi→ be zeroat a point Q.Since the body is in translation equillibrium, we have:ΣFi→=0 ...1Again, torque about P is zero. Therefore, we have:Σrpi→×Fi→=0 ...2Now, torque about point Q will be: Σr→Qi×Fi→=Σr→QP+r→Pi×Fi→ From fig. 13=Σr→QP×Fi→+rPi→×Fi→=ΣrQP→×Fi→+ΣrPi→×Fi→=rQP→×ΣFi→+0 From 2=rQP→×0 From 1=0Thus, F→ is zero about any other point Q. 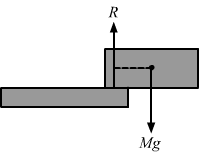 A rectangular brick is kept on a table with a part of its length projecting out. It remains at rest if the length projected is slightly less than half the total length but it falls down if the length projected is slightly more than half the total length. Give reason. The centre of mass CM of a rectangular block lies in the middle of the block. When the block is projected less than half of its length (CM being over the table), no net force acts on it. Thus, no net torque acts upon the body. But if the block is projected more than half of its length outside the table (CM being outside the table), gravitational force acts along the CM of the block. This force produces a moment along the edge of the table. This rotates the block, and as a result, it falls down. When a fat person tries to touch his toes, keeping the legs straight, he generally falls. Explain with reference to figure (10-Q2). When the man tries to touch his toe, he exerts force along the hand downwards. This force produces amoment along the Centre of Mass CM of the man as shown in the figure. This moment makes him rotateand, thus, he falls down after losing the balance. A ladder is resting with one end on a vertical wall and the other end on a horizontal floor. If it more likely to slip when a man stands near the bottom or near the top? The ladder is more likely to slide when the man stands near the top. This is because when the man stands near the top, it creates more torque compared to the torque caused by the weight of man near the bottom. When the man stands near the bottom, the Centre of Gravity of the ladder is shifted to C' from C. Now, the couple due to forces m+Mg and N makes the ladder fall. We see that due to its shift from C to C', the moment arm of the couple decreases from r to r'; hence, the couple decreases. When the man stands near the top of the ladder, the Centre of Mass shifts from C to C'. This increases the moment arm of the couple and from r to r'.Increase in moment arm increases the couple and, thus, the ladder easily falls. When a body is weighed on an ordinary balance we demand that the arum should be horizontal if the weights on the two pans are equal. Suppose equal weights are put on the two pans, the arm is kept at an angle with the horizontal and released. Is the torque of the two weights about the middle point (point of support) zero? Is the total torque zero? If so, why does the arm rotate and finally become horizontal? When the balance is kept at an angle, there is a net extra torque given to one of its arm. When the extra torque is removed, the balance becomes torque free and sum of all the torque acting on it is zero. But balance kept at an angle has got a greater potential energy compared to the balance kept horizontal. The potential energy acquired is due to the initial torque applied on it. This displaces the balance by an angle. As soon as the body is set free to rotate, the body tends to have the lowest potential energy. Thus, potential energy starts converting in to kinetic energy, but on the other side, kinetic energy converts into potential energy when the other arm of the balance is raised. This energy transformation oscillates the balance. But in this process, friction with the air and fulcrum dissipates energy converting into heat. Finally, the balance loses the energy and becomes horizontal, or attains equilibrium. The density of a rod AB continuously increases from A to B. Is it easier to set it in rotation by clamping it at A and applying a perpendicular force at B or by clamping it at B and applying the force at A? It will require more force to set the bar into rotation by clamping at A and then clamping at B. Explanation: Since the rod has mass density increasing towards B, the Center of Mass (CM) of the rod is near B. If the rod is clamped along A, the distance of CM of the rod from the pivot will be greater when the rod is clamped along B. Greater distance of CM from the Center of rotation increases the moment of inertia of the rod and hence more torque will be necessary to rotate the bar about A. Greater torque implies greater force will be necessary to rotate it. We have to find the torque required to rotate rod clamped at A to produce angular acceleration a. We have to find torque required to rotate rod clamped at B to produce angular acceleration a. When tall building are constructed on earth, the duration of day-night slightly increases. Is it true? Yes, because tall buildings have their CM much above the ground. It increases moment of inertia of the Earth. As the Earth’s rotation does not involve torque, its angular momentum is constant. Thus, an increase in MI leads to lower angular velocity of the Earth about its axis of rotation. This means length of night and day will increase. However, the increase is very small. If the ice at the poles melts and flows towards the equator, how will it affect the duration of day-night? Ice caps near the poles concentrate the mass of water at the poles through which axis of rotation of the Earth passes. If the ice melts, water will spread across the globe due to hydrostatic equilibrium and tend to move to the equatorial areas of the Earth due to centrifugal force of rotation. Mass, now being distributed more along the equator, will increase MI of the Earth and this in turn will decrease the angular velocity of the Earth. Decrease in angular velocity will increase the duration of day-night. A hollow sphere, a solid sphere, a disc and a ring all having same mass and radius are rolled down on an inclined plane. If no slipping takes place, which one will take the smallest time to cover a given length? The body with the smallest moment of inertia will roll down taking the smallest time. Here, the solid sphere has the lowest moment of inertia among all the other bodies. So, it will roll down taking the least time. A sphere rolls on a horizontal surface. If there any point of the sphere which has a vertical velocity? Some points on the equator of the sphere has got vertical velocity with respect to the direction of motion of the sphere. For a purely rotating body, the axis of rotation is always perpendicular to the velocity of the particle. The unit vector along the axis of rotation and the unit vector along the resultant force on the particle are perpendicular to each other in a uniform rotation. m, v and y are constant; therefore, angular momentum remains constant. (d) ω is independent of r.
In a pure rotation, angular velocity of all the particles remains same and does not depend on the position of the particle from the axis of rotation. It is given that angular velocity is same for both the wheels. Because resultant force on a particle of the body rotating uniformly is always perpendicular to the rotation axis and pass through it. The resultant force on a particle of the body rotating non-uniformly is always horizontal and skew with the rotation axis because net torque on the body is non-zero. Thus, τ→ is perpendicular to r→ and F→. Consider a small portion of rod at a distance x from the clamped end (as shown in fig.) with width dx and mass dm. (d) at a distance larger than l/2 from O. (c) at a distance l/2 from O. It is given that there is no force along x-axis. COM of rod will remain and will not shift along x-axis (horizontal direction). Force gravity is acting along y-axis (vertical direction). So, COM will shift along the y-axis by l/2 distance and COM of horizontal rod is at a distance l/2 from one end. Therefore, lower end of the rod will remain at a distance l/2 from O. (d) depends on the actual values of t and r.
Here, t is the thickness of the disc. (d) the relation depends on the actual magnitude of the torques. (d) increases if the rotation is clockwise and decreases if it is anticlockwise. Moment of inertia of a mass is directly proportional to the square of the distance of mass from the axis of rotation. As the tube is rotated, water is collected at the end of tube because of centrifugal force and distance from the rotation axis increases. Hence, moment of inertia increases. Consider an element of length, dl = rdθ. Let I1 an I2 be the moments of inertia of two bodies of identical geometrical shape, the first made of aluminium and the second of iron. (d) relation between I1 and I2 depends on the actual shapes of the bodies. The density of iron is more; therefore, I2 will be greater. (d) cannot be deduced with this information. We have three equations and four variables. So, Iz cannot be deduced with the given information. Let N be the normal reaction on the block. From the free body diagram of the block, it is clear that the forces N and mgcosθ pass through the same line. Therefore, there will be no torque due to N and mgcosθ. The only torque will be produced by mgsinθ. No external torque is applied on the ring; therefore, the angular momentum will be conserved. Rate of change of angular momentum of the body is directly proportional to the net external torque acting on the body. No external torque is applied on the person or on the table; therefore, the angular momentum will be conserved. As shown in the figure, the velocity of the particle will be the resultant of v0 and ωr. As the distance covered in one revolution about the centre is less than the perimeter of the wheel, it means that the direction of torque due to frictional force opposes the motion of wheel, i.e., the frictional force acting on the wheel by the surface is along the velocity of the wheel. Therefore, increase in petrol input will not affect the angular velocity and hence the linear velocity of the scooter will remain the same. (d) all will take same time. The incline is smooth; therefore, all bodies will slip on the incline. Also, as the mass of bodies is same, they will reach the bottom in equal time. Let θ be the inclination angle. The friction coefficients between the objects and the incline are same and not sufficient to allow pure rolling; therefore, all the bodies come down with the same acceleration. (d) all will achieve same kinetic energy. Torque is same for all the bodies; therefore, the angular momentum will be conserved. So, the body with greater value of moment of inertia will have smallest kinetic energy at the bottom of the incline. Hence, the hollow sphere will have the smallest kinetic energy at the bottom. As shown in the figure, the velocity of the string will be resultant of v0 and ωr. (d) may pass through a particle of the body. It is not necessary that the axis of rotation of a purely rotating body should pass through the centre of mass or through a particle of the body. It can also lie outside the body. Here, Γtotal is is the total torque on the system due to all the external forces acting on the system. So, equation (B) is not true as in non-inertial frames, pseudo force must be applied to study the motion of the object. (d) about any given point remains constant. If the point is on the straight line, r→and v→ will have the same direction and their cross product will be zero. Hence, angular momentum is zero. (c) If the point is not on the straight line, r→and v→ will not have the same direction and their cross product will not be zero. Hence, angular momentum is non-zero. (d) No external torque is applied on the body; therefore, its angular momentum about any given point remains constant. If there is no external force acting on a nonrigid body, which of the following quantities must remain constant? Let IA and IB be moments of inertia of a body about two axes A and B respectively. The axis A passes through the centre of mass of the body but B does not. (d) If the axes are not parallel, IA ≥ IB. Here, r is the distance between two axes and m is the mass of the body. A sphere is rotating about a diameter. (a) The particles on the surface of the sphere do not have any linear acceleration. (b) The particles on the diameter mentioned above do not have any linear acceleration. (c) Different particles on the surface have different angular speeds. (d) All the particles on the surface have same linear speed. The sphere is rotating about a diameter; therefore, the position vector of the particles on the diameter is zero. Thus, linear acceleration of the particle is zero. All the particles of the body have the same angular velocity. All the particle on the surface have different linear speeds that depend on the position of the particle from the axis of rotation. A wheel is making revolutions about its axis with uniform angular acceleration. Starting from rest, it reaches 100 rev/sec in 4 seconds. Find the angular acceleration. Find the angle rotated during these four seconds. A wheel rotating with uniform angular acceleration covers 50 revolutions in the first five seconds after the start. Find the angular acceleration and the angular velocity at the end of five seconds. A wheel starting from rest is uniformly accelerated at 4 rad/s2 for 10 seconds. It is allowed to rotate uniformly for the next 10 seconds and is finally brought to rest in the next 10 seconds. Find the total angle rotated by the wheel. It is given that the area under the ω-t curve gives the total angular displacement. ∴ Total angle rotated in 30 s = 800 rad. (d) torque of the applied force. The torque of the applied force does not depend on the density of a rod. It depend on the distance between the pivot and the point where F is applied. So, it does not depend on which end of the rod is pivoted. Consider a wheel of a bicycle rolling on a level road at a linear speed ν0 (figure 10-Q5). (d) the speed of B is greater than the speed of O.
Velocity of the particle at A, B, C and D will be resultant of v0 and ωr. (d) the information given is not sufficient to tell which sphere will reach the bottom first. a is independent of mass and radii; therefore, the two spheres reach the bottom together. A hollow sphere and a solid sphere having same mss and same radii are rolled down a rough inclined plane. (a) The hollow sphere reaches the bottom first. (b) The solid sphere reaches the bottom with greater speed. (c) The solid sphere reaches the bottom with greater kinetic energy. (d) The two spheres will reach the bottom with same linear momentum. The acceleration of the solid sphere is greater; therefore, it will reach the bottom with greater speed. (d) a rough inclined surface. A sphere cannot roll on a smooth inclined surface and on a smooth horizontal surface because there is no backward force (force of friction) to prevent its slipping. (d) on the car is in the backward direction. (a) On the rear wheels, friction force is in the forward direction because it favours the motion and accelerates the car in forward direction. (b) Because of the movement of the car in forward direction, front wheels push the road in forward direction and in reaction, the road applies friction force in the backward direction. (c) As the car is moving in forward direction, the rear wheels have larger magnitude of friction force (in forward direction) than on the front wheels. (d) the angular momentum of the sphere about its centre will remain constant. 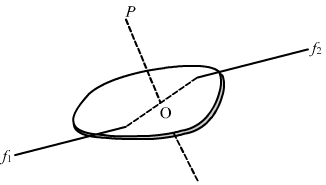 The given coefficient of friction (17g tanθ) is less than the coefficient friction (27g tanθ) required for perfect rolling of the sphere on the inclined plane. Therefore, sphere may slip while rolling and it will translate and rotate about the centre. (d) decrease the angular velocity. If a sphere is rolled on a rough horizontal surface, the force of friction tries to oppose the linear motion and favours the angular motion. (d) its linear velocity will slowly decrease. Therefore, if the sphere is set in pure rolling on the incline, it will continue pure rolling. A body rotates about a fixed axis with an angular acceleration of one radian/second. Through what angle does it rotate during the time in which its angular velocity increases from 5 rad/s to 15 rad/s. Find the angular velocity of a body rotating with an acceleration of 2 rev/s2 as it completes the 5th revolution after the start. (b) the middle point of a radius. A disc rotates about its axis with a constant angular acceleration of 4 rad/s2. Find the radial and tangential accelerations of a particle at a distance of 1 cm from the axis at the end of the first second after the disc starts rotating. A block hangs from a string wrapped on a disc of radius 20 cm free to rotate about its axis which is fixed in a horizontal position. If the angular speed of the disc is 10 rad/s at some instant, with what speed is the block going down at that instant? It is given that the string is moving on the rim of the disc and block is connected with the string. Therefore, the speeds of the block going down and the rim will be same. 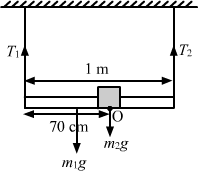 (b) passing through one of the particles and perpendicular to the plane of the particles. (b) Now, let the axis of rotation passes through A and is perpendicular to the plane of triangle. Particles of masses 1 g, 2 g, 3 g, .........., 100 g are kept at the marks 1 cm, 2 cm, 3 cm, ..........., 100 cm respectively on a metre scale. Find the moment of inertia of the system of particles about a perpendicular bisector of the metre scale. It is given that the perpendicular bisector of the metre scale is passed through the 50th particle. Therefore, on the L.H.S. of the axis, there will be 49 particles and on the R.H.S., there will be 50 particles. Consider the two particles positioned at 49 cm and 51 cm. I2 = 100 × (2)2 gm-cm2. Here, I' is the moment of inertia of particle at 100 cm. Find the moment of inertia of a pair of spheres, each having a mass mass m and radius r, kept in contact about the tangent passing through the point of contact. It is given that two bodies of mass m and radius r are moving along a common tangent. The moment of inertia of a uniform rod of mass 0⋅50 kg and length 1 m is 0⋅10 kg-m2 about a line perpendicular to the rod. Find the distance of this line from the middle point of the rod. Let the rod moves at a distance d from the centre. Find the radius of gyration of circular ring of radius r about a line perpendicular to the plane of the ring and passing through one of its particles. The radius of gyration of a uniform disc about a line perpendicular to the disc equals its radius. Find the distance of the line from the centre. Let there be a small sectional area of width dx at a distance x from the x-axis. The surface density (mass/area) of a circular disc of radius a depends on the distance from the centre as ρr=A+Br. Find its moment of inertia about the line perpendicular to the plane of the disc thorough its centre. Consider a ring of thickness dx at a distance r from the centre of the disc. A particle of mass m is projected with a speed u at an angle θ with the horizontal. Find the torque of the weight of the particle about the point of projection when the particle is at the highest point. Therefore, the direction of torque is perpendicular to the plane of the motion. 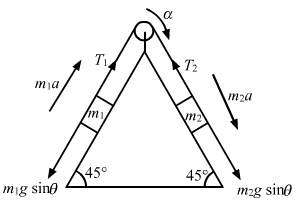 A simple pendulum of length l is pulled aside to make an angle θ with the vertical. Find the magnitude of the torque of the weight ω of the bob about the point of suspension. When is the torque zero? Here, w is the weight of the bob. The torque will be zero when the force acting on the body passes through the point of suspension, i.e., at the lowest point of suspension. When a force of 6⋅0 N is exerted at 30° to a wrench at a distance of 8 cm from the nut, it is just able to loosen the nut. What force F would be sufficient to loosen it if it acts perpendicularly to the wrench at 16 cm from the nut? To loosen the nut, torque in both the cases should be the same. Calculate the total torque acting on the body shown in figure (10-E2) about the point O. Let the anticlockwise torque and clockwise acting torque be positive and negative, respectively. Torque at O due to 5 N force is zero as it is passing through O. A cubical block of mass m and edge a slides down a rough inclined plane of inclination θ with a uniform speed. Find the torque of the normal force acting on the block about its centre. From the free body diagram of the block, it is clear that forces N and mgcosθ pass through the same line. So, there will be no torque due to N and mgcosθ. 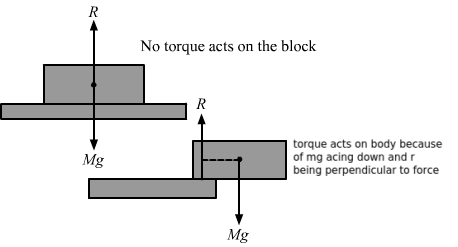 The only torque will be produced by mgsinθ. A rod of mass m and length L, lying horizontally, is free to rotate about a vertical axis through its centre. A horizontal force of constant magnitude F acts on the rod at a distance of L/4 from the centre. The force is always perpendicular to the rod. Find the angle rotated by the rod during the time t after the motion starts. Let the torque produces an angular acceleration α. A square plate of mass 120 g and edge 5⋅0 cm rotates about one of the edges. If it has a uniform angular acceleration of 0⋅2 rad/s2, what torque acts on the plate? 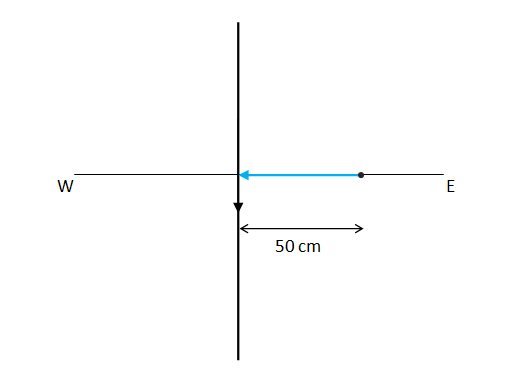 Consider a small area element of width dx and length a at a distance x from the axis of rotation. τ=ma23×α =120×10-3×52×10-43×.02 =40×25×10-7×0.2 =2×10-5 N-m. Calculate the torque on the square plate of the previous problem if it rotates about a diagonal with the same angular acceleration. A flywheel of moment of inertia 5⋅0 kg-m2 is rotated at a speed of 60 rad/s. Because of the friction at the axle, it comes to rest in 5⋅0 minutes. Find (a) the average torque of the friction, (b) the total work done by the friction and (c) the angular momentum of the wheel 1 minute before it stops rotating. Let the angular deceleration produced due to frictional force be α. Because of the friction between the water in oceans with the earth's surface, the rotational kinetic energy of the earth is continuously decreasing. If the earth's angular speed decreases by 0⋅0016 rad/day in 100 years, find the average torque of the friction on the earth. Radius of the earth is 6400 km and its mass is 6⋅0 × 1024 kg. A wheel rotating at a speed of 600 rpm (revolutions per minute) about its axis is brought to rest by applying a constant torque for 10 seconds. Find the angular deceleration and the angular velocity 5 seconds after the application of the torque. A wheel of mass 10 kg and radius 20 cm is rotating at an angular speed of 100 rev/min when the motor is turned off. Neglecting the friction at the axle, calculate the force that must be applied tangentially to the wheel to bring it to rest in 10 revolutions. A cylinder rotating at an angular speed of 50 rev/s is brought in contact with an identical stationary cylinder. Because of the kinetic friction, torques act on the two cylinders accelerating the stationary one and decelerating the moving one. If the common magnitude of the acceleration and deceleration be one revolution per second square, how long will it take before the two cylinders have equal angular speed? After t seconds, let the angular velocity of two cylinders be ω. A body rotating at 20 rad/s is acted upon by a constant torque providing it a deceleration of 2 rad/s2. At what time will the body have kinetic energy same as the initial value if the torque continues to act? So, in 10 s the body will come to rest. The same torque continues to act on the body, therefore, it will produce the same angular acceleration. The kinetic energy of the body is same as the initial value; therefore, its angular velocity should be equal to the initial value ω0. A light rod of length 1 m is pivoted at its centre and two masses of 5 kg and 2 kg are hung from the ends as shown in figure (10-E3). Find the initial angular acceleration of the rod assuming that it was horizontal in the beginning. Suppose the rod in the previous problem has a mass of 1 kg distributed uniformly over its length. (a) Find the initial angular acceleration of the rod. (b) Find the tension in the supports to the blocks of mass 2 kg and 5 kg. Figure (10-E4) shows two blocks of mass m and M connected by a string passing over a pulley. 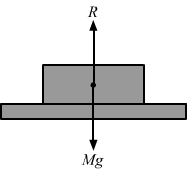 The horizontal table over which the mass m slides is smooth. The pulley has a radius r and moment of inertia I about its axis and it can freely rotate about this axis. Find the acceleration of the mass M assuming that the string does not slip on the pulley. A string is wrapped on a wheel of moment of inertia 0⋅20 kg-m2 and radius 10 cm and goes through a light pulley to support a block of mass 2⋅0 kg as shown in figure (10-E5). Find the acceleration of the block. Suppose the smaller pulley of the previous problem has its radius 5⋅0 cm and moment of inertia 0⋅10 kg-m2. Find the tension in the part of the string joining the pulleys. The pulleys in figure (10-E6) are identical, each having a radius R and moment of inertia I. Find the acceleration of the block M.
The descending pulley shown in figure (10-E7) has a radius 20 cm and moment of inertia 0⋅20 kg-m2. The fixed pulley is light and the horizontal plane frictionless. Find the acceleration of the block if its mass is 1⋅0 kg. Let the mass of block be m1 and mass of pulley be m2. Acceleration of the massive pulley will be half of that of the block. The pulley shown in figure (10-E8) has a radius 10 cm and moment of inertia 0⋅5 kg-m2 about its axis. Assuming the inclined planes to be frictionless, calculate the acceleration of the 4⋅0 kg block. Solve the previous problem if the friction coefficient between the 2⋅0 kg block and the plane below it is 0⋅5 and the plane below the 4⋅0 kg block is frictionless. A uniform metre stick of mass 200 g is suspended from the ceiling thorough two vertical strings of equal lengths fixed at the ends. A small object of mass 20 g is placed on the stick at a distance of 70 cm from the left end. Find the tensions in the two strings. A uniform ladder of length 10⋅0 m and mass 16⋅0 kg is resting against a vertical wall making an angle of 37° with it. The vertical wall is frictionless but the ground is rough. An electrician weighing 60⋅0 kg climbs up the ladder. If he stays on the ladder at a point 8⋅00 m from the lower end, what will be the normal force and the force of friction on the ladder by the ground? What should be the minimum coefficient of friction for the electrician to work safely? Let N2 be the normal force on the ladder by the ground. Let N1 be the normal force on the ladder by the wall. Let fr be the force of friction on the ladder by the ground. Suppose the friction coefficient between the ground and the ladder of the previous problem is 0⋅540. Find the maximum weight of a mechanic who could go up and do the work form the same position of the ladder. Let the maximum mass of a mechanic who could go up be m.
Therefore, weight of the mechanic, who can go up and do the work, should be less than 44 kg. A 6⋅5 m long ladder rests against a vertical wall reaching a height of 6⋅0 m. A 60 kg man stands half way up the ladder. (a) Find the torque of the force exerted by the man on the ladder about the upper end of the ladder. (b) Assuming the weight of the ladder to be negligible as compared to the man and assuming the wall to be smooth, find the force exerted by the ground on the ladder. (a) We have to find the torque due to the weight of the body about the upper end of the ladder. (b) Let us find the vertical force exerted by the ground on the ladder. The door of an almirah is 6 ft high, 1⋅5 ft wide and weighs 8 kg. The door is supported by two hinges situated at a distance of 1 ft from the ends. If the magnitudes of the forces exerted by the hinges on the door are equal, find this magnitude. It is given that the magnitudes of the forces exerted by the hinges on the door are equal. A uniform rod of length L rests against a smooth roller as shown in figure (10-E9). Find the friction coefficient between the ground and the lower end if the minimum angle that the rod can make the horizontal is θ. It makes an angle θ with the floor. Height of the wall is h.
A uniform rod of mass 300 g and length 50 cm rotates at a uniform angular speed of 2 rad/s about an axis perpendicular to the rod through an end. Calculate (a) the angular momentum of the rod about the axis of rotation, (b) the speed of the centre of the rod and (c) its kinetic energy. A uniform square plate of mass 2⋅0 kg and edge 10 cm rotates about one of its diagonals under the action of a constant torque of 0⋅10 N-m. Calculate the angular momentum and the kinetic energy of the plate at the end of the fifth second after the start. Let ω be the angular velocity after time t (t = 5 s). Calculate the ratio of the angular momentum of the earth about its axis due to its spinning motion to that about the sun due to its orbital motion. Radius of the earth = 6400 km and radius of the orbit of the earth about the sun = 1⋅5 × 108 km. Two particles of masses m1 and m2 are joined by a light rigid rod of length r. The system rotates at an angular speed ω about an axis through the centre of mass of the system and perpendicular to the rod. Show that the angular momentum of the system is L=μ r2ω where μ is the reduced mass of the system defined as μ=m1+m2m1+m2. A dumb-bell consists of two identical small balls of mass 1/2 kg each connected to the two ends of a 50 cm long light rod. The dumb-bell is rotating about a fixed axis thorough the centre of the rod and perpendicular to it at an angular speed of 10 rad/s. An impulsive force of average magnitude 5⋅0 N acts on one of the masses in the direction of its velocity for 0⋅10 s. Find the new angular velocity of the system. A wheel of moment of inertia 0⋅500 kg-m2 and radius 20⋅0 cm is rotating about its axis at an angular speed of 20⋅0 rad/s. It picks up a stationary particle of mass 200 g at its edge. Find the new angular speed of the wheel. A diver having a moment of inertia of 6⋅0 kg-m2 about an axis thorough its centre of mass rotates at an angular speed of 2 rad/s about this axis. If he folds his hands and feet to decrease the moment of inertia to 5⋅0 kg-m2, what will be the new angular speed? Let ω2 be the final angular velocity of the diver. A boy is seated in a revolving chair revolving at an angular speed of 120 revolutions per minute. Two heavy balls form part of the revolving system and the boy can pull the balls closer to himself or may push them apart. If by pulling the balls closer, the boy decreases the moment of inertia of the system from 6 kg-m2 to 2 kg-m2, what will be the new angular speed? A boy is standing on a platform which is free to rotate about its axis. The boy holds an open umbrella in his hands. The axis of the umbrella coincides with that of the platform. The moment of inertia of "the platform plus the boy system" is 3⋅0 × 10−3 kg-m2 and that of the umbrella is 2⋅0 × 10−3 kg-m2. The boy starts spinning the umbrella about the axis at an angular speed of 2⋅0 rev/s with respect to himself. Find the angular velocity imparted to the platform. Let the angular velocity imparted to the platform be ω2. A wheel of moment of inertia 0⋅10 kg-m2 is rotating about a shaft at an angular speed of 160 rev/minute. A second wheel is set into rotation at 300 rev/minute and is coupled to the same shaft so that both the wheels finally rotate with a common angular speed of 200 rev/minute. Find the moment of inertia of the second wheel. Let I2 be the moment of inertia of the second wheel. A kid of mass M stands at the edge of a platform of radius R which can be freely rotated about its axis. The moment of inertia of the platform is I. The system is at rest when a friend throws a ball of mass m and the kid catches it. If the velocity of the ball is ν horizontally along the tangent to the edge of the platform when it was caught by the kid, find the angular speed of the platform after the event. Suppose the platform of the previous problem is brought to rest with the ball in the hand of the kid standing on the rim. The kid throws the ball horizontally to his friend in a direction tangential to the rim with a speed ν as seen by his friend. Find the angular velocity with which the platform will start rotating. Initial angular momentum of the system is zero (L1 = 0). Let the platform starts rotating with an angular velocity ω. Suppose the platform with the kid in the previous problem is rotating in anticlockwise direction at an angular speed ω. The kid starts walking along the rim with a speed ν relative to the platform also in the anticlockwise direction. Find the new angular speed of the platform. Let ω' be the angular velocity of platform after the kid starts walking. Let ω be the angular velocity of the wheel before walking. When we see the (kid-wheel) system from the initial frame of reference, we can find that the wheel moves with a speed of ω and the kid with a speed of ω'+νR, after the kid has started walking. External torque is zero; therefore, angular momentum is conserved. (a) the speed of the centre of mass, (b) the angular speed of the rod about the centre of mass, (c) the kinetic energy of the rod and (d) the angular momentum of the rod about the centre of mass after the force has stopped to act. Assume that t is so small that the rod does not appreciably change its direction while the force acts. (b) Let the angular speed about the centre of mass be ω. 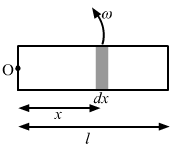 A uniform rod of length L lies on a smooth horizontal table. 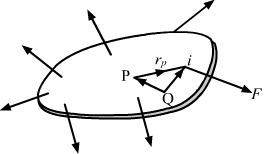 A particle moving on the table strikes the rod perpendicularly at an end and stops. Find the distance travelled by the centre of the rod by the time it turns through a right angle. Show that if the mass of the rod is four times that of the particle, the collision is elastic. Now by we consider the angular momentum imparted by the particle to the rod. => ω = 6mu1/ML ---2. Suppose the particle of the previous problem has a mass m and a speed ν before the collision and it sticks to the rod after the collision. The rod has a mass M. (a) Find the velocity of the centre of mass C of the system constituting "the rod plus the particle". (b) Find the velocity of the particle with respect to C before the collision. (c) Find the velocity of the rod with respect to C before the collision. (d) Find the angular momentum of the particle and of the rod about the centre of mass C before the collision. (e) Find the moment of inertia of the system about the vertical axis through the centre of mass C after the collision. (f) Find the velocity of the centre of mass C and the angular velocity of the system about the centre of mass after the collision. (a) It is given that no external torque and force is applied on the system. Two small balls A and B, each of mass m, are joined rigidly by a light horizontal rod of length L. The rod is clamped at the centre in such a way that it can rotate freely about a vertical axis through its centre. The system is rotated with an angular speed ω about the axis. A particle P of mass m kept at rest sticks to the ball A as the ball collides with it. Find the new angular speed of the rod. Let the new angular speed of the rod be ω'. Here, net torque on the system is zero. So, the angular momentum is conserved. 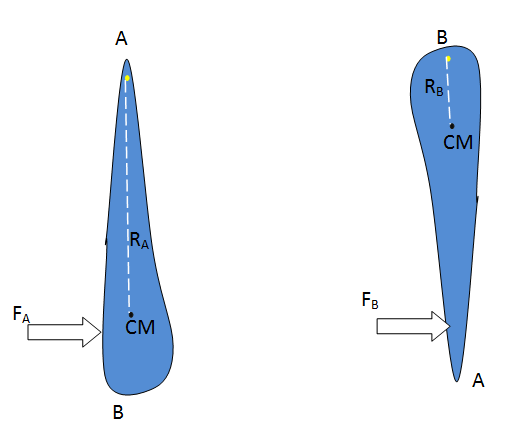 (a) the linear speeds of the balls A and B after the collision, (b) the velocity of the centre of mass C of the system A + B + P and (c) the angular speed of the system about C after the collision. (a) Collision will not affect the velocity of ball B because the light rod will exert a force on it only along its length. Suppose the rod with the balls A and B of the previous problem is clamped at the centre in such a way that it can rotate freely about a horizontal axis through the clamp. The system is kept at rest in the horizontal position. A particle P of the same mass m is dropped from a height h on the ball B. The particle collides with B and sticks to it. (a) Find the angular momentum and the angular speed of the system just after the collision. (b) What should be the minimum value of h so that the system makes a full rotation after the collision. Let the particle P collides the ball B with a speed u and system moves with speed v just after the collision. 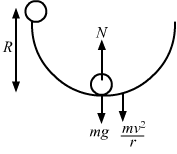 Two blocks of masses 400 g and 200 g are connected through a light string going over a pulley which is free to rotate about its axis. The pulley has a moment of inertia 1·6×10-4 kg-m2 and a radius 2⋅0 cm, Find (a) the kinetic energy of the system as the 400 g block falls through 50 cm, (b) the speed of the blocks at this instant. The pulley shown in figure (10-E11) has a radius of 20 cm and moment of inertia 0⋅2 kg-m2. The string going over it is attached at one end to a vertical spring of spring constant 50 N/m fixed from below, and supports a 1 kg mass at the other end. The system is released from rest with the spring at its natural length. Find the speed of the block when it has descended through 10 cm. Take g = 10 m/s2. A metre stick is held vertically with one end on a rough horizontal floor. It is gently allowed to fall on the floor. Assuming that the end at the floor does not slip, find the angular speed of the rod when it hits the floor. Let the mass of the rod and its angular velocity be m and ​ω (when hits the ground), respectively. It is given that the rod has rotational motion only. A metre stick weighing 240 g is pivoted at its upper end in such a way that it can freely rotate in a vertical place through this end (figure 10-E12). A particle of mass 100 g is attached to the upper end of the stick through a light string of length 1 m. Initially, the rod is kept vertical and the string horizontal when the system is released from rest. The particle collides with the lower end of the stick and sticks there. 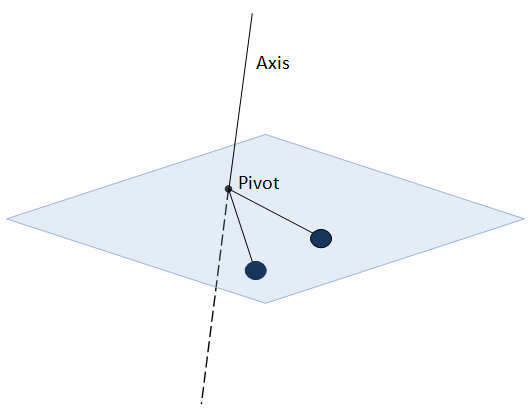 Find the maximum angle through which the stick will rise. Let the angular velocity of stick after the collision be ω. Find the magnitude of the force acting on a particle of mass dm at the tip of the rod when the rod makes and angle of 37° with the vertical.A uniform rod pivoted at its upper end hangs vertically. It is displaced through an angle of 60° and then released. Let the length of the rod be l.
Mass of the rod be m.
Let the angular velocity of the rod be ω when it makes an angle of 37° with the vertical. Let the angular acceleration of the rod be α when it makes an angle of 37° with the vertical. So, total force on the particle of mass dm at the tip of the rod will be the resultant of Fc and Ft.
A cylinder rolls on a horizontal place surface. If the speed of the centre is 25 m/s, what is the speed of the highest point? Let vc be the translational velocity of the cylinder. Let ω be the rotational velocity of the cylinder. Let r be the radius of the cylinder. A sphere of mass m rolls on a plane surface. Find its kinetic energy at an instant when its centre moves with speed ν. Let radius of the sphere be R and its angular speed be ω. A string is wrapped over the edge of a uniform disc and the free end is fixed with the ceiling. The disc moves down, unwinding the string. Find the downward acceleration of the disc. Let the radius of the disc be R.
Let the tension in the string be T.
Let the acceleration of the disc be a. A small spherical ball is released from a point at a height h on a rough track shown in figure (10-E13). Assuming that it does not slip anywhere, find its linear speed when it rolls on the horizontal part of the track. Let r be the radius of the ball. Let v be the linear speed of the ball when it rolls on the horizontal part of the track. Let ω be the angular speed of the ball when it rolls on the horizontal part of the track. Potential energy the ball has gained w.r.t. the surface will be converted to angular kinetic energy about the centre and linear kinetic energy. A small disc is set rolling with a speed ν on the horizontal part of the track of the previous problem from right to left. To what height will it climb up the curved part? Let the angular velocity of the disc ω. Let the height attained by the disc be h.
A sphere starts rolling down an incline of inclination θ. Find the speed of its centre when it has covered a distance l.
Let radius of the sphere be r. Let r be negligible w.r.t. l.
A hollow sphere is released from the top of an inclined plane of inclination θ. (a) What should be the minimum coefficient of friction between the sphere and the plane to prevent sliding? (b) Find the kinetic energy of the ball as it moves down a length l on the incline if the friction coefficient is half the value calculated in part (a). It is given that a hollow sphere is released from the top of an inclined plane of inclination θ. A solid sphere of mass m is released from rest from the rim of a hemispherical cup so that it rolls along the surface. If the rim of the hemisphere is kept horizontal, find the normal force exerted by the cup on the ball when the ball reaches the bottom of the cup. The radius of the solid sphere (r) is negligible w.r.t. the radius of the hemispherical cup (R). Let the ball reaches the bottom of the cup with a velocity v and angular velocity ω. Figure (10-E14) shows a rough track, a portion of which is in the form of a cylinder of radius R. With what minimum linear speed should a sphere of radius r be set rolling on the horizontal part so that it completely goes round the circle on the cylindrical part. Let the sphere be thrown with velocity v' and its velocity becomes v at the top-most point. Figure (10-E15) shows a small spherical ball of mass m rolling down the loop track. The ball is released on the linear portion at a vertical height H from the lowest point. The circular part shown has a radius R.
(a) Find the kinetic energy of the ball when it is at a point A where the radius makes an angle θ with the horizontal. (b) Find the radial and the tangential accelerations of the centre when the ball is at A. (c) Find the normal force and the frictional force acting on the if ball if H = 60 cm, R = 10 cm, θ = 0 and m = 70 g.
(a) Let the velocity and angular velocity of the ball at point A be v and ω, respectively. (b) Let us now find the acceleration components. A thin spherical shell of radius R lying on a rough horizontal surface is hit sharply and horizontally by a cue. Where should it be hit so that the shell does not slip on the surface? If the shell does not slip on the surface, its motion should be pure rolling. Let the cue hits at a height 'h' above the centre. Let the centre of shell moves with velocity vc and shell rotates with angular velocity ω after hitting. A uniform wheel of radius R is set into rotation about its axis at an angular speed ω. This rotating wheel is now placed on a rough horizontal surface with its axis horizontal. Because of friction at the contact, the wheel accelerates forward and its rotation decelerates till the wheel starts pure rolling on the surface. Find the linear speed of the wheel after it starts pure rolling. As no external torque is applied, angular momentum will be conserved. 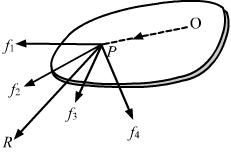 A thin spherical shell lying on a rough horizontal surface is hits by a cue in such a way that the line of action passes through the centre of the shell. As a result, the shell starts moving with a linear speed ν without any initial angular velocity. Find the linear speed of the shell after it starts pure rolling on the surface. A hollow sphere of radius R lies on a smooth horizontal surface. It is pulled by a horizontal force acting tangentially from the highest point. Find the distance travelled by the sphere during the time it makes one full rotation. Let M be the mass of the hollow sphere and α be the angular acceleration produced in the sphere by the tangential force F.
Let d be the distance travelled in this time t.
A solid sphere of mass 0⋅50 kg is kept on a horizontal surface. The coefficient of static friction between the surfaces in contact is 2/7. What maximum force can be applied at the highest point in the horizontal direction so that the sphere does not slip on the surface? Let α be the angular acceleration produced in the sphere. 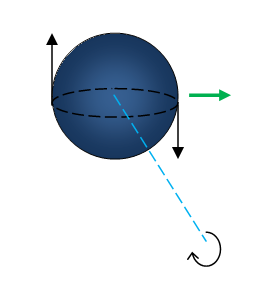 A solid sphere is set into motion on a rough horizontal surface with a linear speed ν in the forward direction and an angular speed ν/R in the anticlockwise directions as shown in figure (10-E16). Find the linear speed of the sphere (a) when it stops rotating and (b) when slipping finally ceases and pure rolling starts. Angular momentum about point A' after it starts pure rolling. A solid sphere rolling on a rough horizontal surface with a linear speed ν collides elastically with a fixed, smooth, vertical wall. Find the speed of the sphere after it has started pure rolling in the backward direction. Let the velocity be ν' and the corresponding angular velocity be v'R. So, the sphere will move with velocity 3v7.